Roller Chain is one of the most commonly used products in power transmission. Most often, the power is conveyed by a roller chain, known as the drive chain. The roller chain passes over a sprocket, with the teeth of the sprocket meshing with the holes in the links of the chain. The sprocket is turned, and this pulls the roller chain, putting mechanical force into the system. 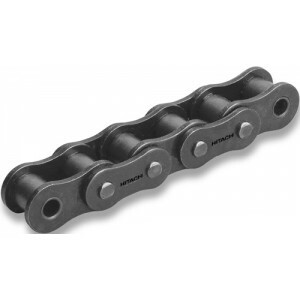 Roller chain is most frequently made of steel; however it is also available in many other materials specific to certain industries and applications. Roller chain is made by numerous manufacturers and as with most types of chain, is interchangeable. There are different features and benefits between manufacturers, and roller chain is readily available from both domestic and global manufacturers at many different price points depending on how precise and how strong of a chain is required. Please contact Bearing Service to assist in providing the correct chain for your application.